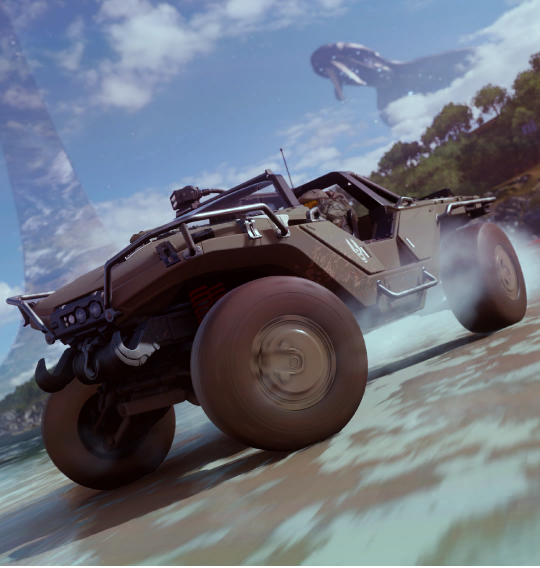 More specifically, it looks like Forza Horizon 4 will feature a showcase event featuring Halo’s Warthog. But that’s not all, one of the leaked images shows a Covenant battlecruiser and a Halo ring in the background. The screenshot is among a few dozen others which leaked on Reddit over the weekend. The image dump also shows a few in-game pamphlets for some of the events dotted around the map. Now, the Halo Warthog has appeared in Forza Horizon games before. Forza Horizon 3 featured a bucket list challenge that tasked players with driving the vehicle while a track from Halo 5’s soundtrack was playing in the background. You eventually could unlock the Warthog and drive it anywhere you want. While the leak all but confirms we’ll be able to drive the Warthog around beautiful Britain, it seems there’s more to it than that. About a month ago, fans spotted an icon for the Pelican – a Halo drop ship – on Forza Horizon 4’s map. The footage, spotted by GokuYourself, was captured from an official stream. Playground Games didn’t mention the icon at the time, but the eagle-eyed YouTuber caught it. Interestingly, this particular event takes place on the eastern coast, so we could be looking at some sort of event that pays homage to the Silent Cartographer mission from the original Halo game we’re all familiar with. Perhaps the Pelican will give our Warthog a lift and we’ll be dropped to race along the beach. It’s certainly not too far fetched, given how bombastic Forza showcase events tend to be. Check the link above for the full set of leaked screens. Forza Horizon 4 is out October 2 on PC, and Xbox One.